Scorpio: Chase scene through Vienna Karlsplatz U-Bahn station. On Saturday I went to the Kino unter Sternen (movies under the stars) on Vienna’s Karlsplatz. The program is being held at Karlsplatz this year (in addition to the regular Kino unter Sternen at the Augarten) because the Wien Museum has a great exhibition called Wien im Film on right now. The Kino unter Sternen is showing a whole series of films made (at least partially) in Vienna. 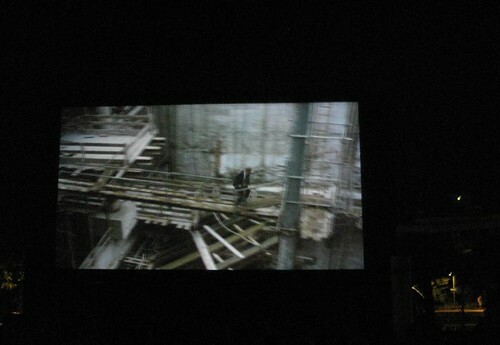 Scorpio was particularly good because the big chase scene was filmed at the Karlsplatz U-Bahn station when it was under construction during the 1970s. Sorry the photo is out of focus. More photos on my flickr photos tagged Scorpio Vienna Kino untern Sternen. More photos are available from the flickr user Kino unter Sternen including one of the Wiener Beschwerdechor (Vienna Complaining Choir) singing before the July 3 movie – see if you can find me!